Photo shows no. 1799 Woodcock with extensive front end damage as well as damage to cab roof and a dent in the tender. The engine was repaired and survived until 1936. Does anyone know when and where the mishap occured? I believe that this is the loco involved in the Weedon Accident of 14/8/1915. I have a different picture of this engine with Woodcock written on the back and have read somewhere that this was the engine involved in this smash. A complete guess, but this report of an accident at Stalybridge on August 27th 1913 looks to be a possibility. The damage suggests collision with goods vehicles rather than another loco. The loco involved at Weedon was 2-4-0 Precedent no. 1189, so not Weedon. This is George the Fifth no. 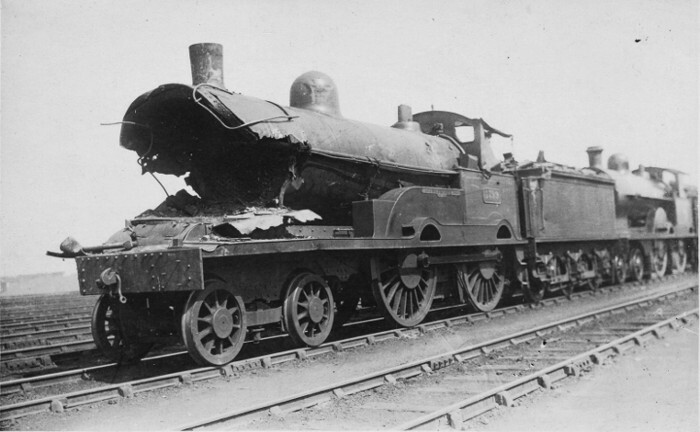 1799 Woodcock following the accident at Bletchley on 11 August 1916. It was on the 10.25 Euston to Liverpool & Manchester express which ran into the rear of an empty stock train that had been shunted onto the down fast line rather than the down slow. The Accident Report can be found here. The report of the Stalybridge accident gives no. 1962 as the engine so that is also ruled out as a possible.